I have just thrown out four pairs of gardening gloves – every one with a hole in the right index finger. It doesn’t seem to matter what they’re made of (see Exhibits A to D), they all wear through first in the same place. The more closely fitting ones also wear through in the right middle finger. In every case, the left glove is intact and perfectly serviceable. What a waste! It started me thinking: surely this is a retail opportunity for a gardening glove manufacturer? 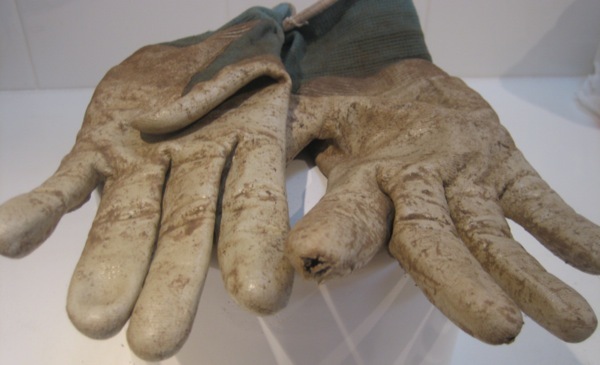 Gloves for right-handed gardeners could be specially reinforced in the right forefinger and middle finger. For the left-handed, the corresponding fingers on the left hand would have the extra strengthening. Maybe there is an eco-warrior solution instead. A right-handed gardener buddies up with a left-handed friend. They each buy a pair of the same sort of gloves. (They have to take the same size of glove of course!) Then, when the inevitable happens, they draw lots to decide who’s going to inherit the remaining undamaged glove from their partner. Am I on to something here?! So true! I’ve gone through 8 pairs of leather rigger’s gloves doing that walling, and it’s always the left hand fingers that wear through! OK so we need a right-handed gardener in the Adelaide Hills for Helen, and a left-handed gardener in western Scotland for Alison……Or parcels of used but undamaged gloves going global! Perhaps some form of global gardening glove registry is in order, but what to call it? Glovetree? Garden glovers? Gloves Labour’s Lost? What about how one always seems to lose one of the gloves – and if you’re right-handed, that’s the one that disappears?